Too many casinos in Macau? Las Vegas Sands (LVS) and MGM Mirage (MGM) might have a long-term reason to welcome another new mega-casino in Macau, but, as they say, in the long term, we'll all be dead. In the short term, however, they will have to vie for visitors with the latest newcomer, the 420,000 square-foot City of Dreams, which will open next week. The City of Dreams is the largest development in Macau by non-Vegas-based prinicipals, in this case, the Melco Crown Entertainment Ltd. (MPEL) The company is a combined effort of Lawrence Ho, son of the longtime king of Macau casinos, Stanley Ho, and James Packer, son of the late Australian media magnate Kerry Packer. Packer also owns gaming companies in the UK and Australia. The senior Ho's company still owns many Macau casinos, including the upscale Grand Lisboa, which opened in 2007. Success of The City of Dreams and the other large new developments will depend on expanding the pie of visitors. Investors are hoping that hoping that the area will now start to reach the critical mass of glitter that Las Vegas did, making it more of a lucrative vacation destination than a day-trip diversion. Currently, the average visitor stay is slightly more than a third that of Las Vegas. Much of this will depend on the Chinese government. It has restricted access to Macau, reportedly over concern about gambling addiction and the possible underworld involvement. For decades, Stanley Ho has been suspected of having ties to organized crime. 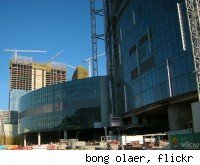 A New Jersey gaming board recently criticized MGM for partnering with Ho's daughter Pansy in the development of its Macau properties. Casino owners hope that a new Macau CEO to be elected in July will be able to convince the government to ease travel restrictions, which could help build traffic. Visitorship to Macau in March was down 5.9 pecent from last March. Overbuilt? Undercapitalized? Macau is certainly starting to resemble Las Vegas. Now if it only had a few hundred thousand homes upside down with sub-prime mortgages . . . That's how the really high rollers gamble.